Your best source for solar water heating systems. Solar water heater systems include storage tanks and solar collectors, and our the perfect replacement for traditional hot water heaters. There are two types of solar water heating systems for homeowners to choose from: active, which have circulating pumps and controls, and passive, which don’t. Most solar water heaters require a well-insulated storage tank. Solar water heater storage tanks have an additional outlet and inlet connected to and from the collector. In two-tank systems, the solar water heater preheats water before it enters the conventional water heater in a home. In one-tank systems, the back-up heater is combined with the solar storage in one tank. Our professional solar water heater contractors can help you with the selection and installation of a solar water heating system for your home today. Just give us a call to learn more and get started toward an energy efficient, green solution for heating water! Why? Because we don’t make our customers wait around all day for our plumbers to show up to take care of their hot water heater needs! We arrive ON TIME for all appointments, ensuring our customers receive reliable service when scheduled. Whether you are looking to purchase and install a solar water heating system or need repairs made to traditional hot water tanks, we are the plumber you can trust for quality results. 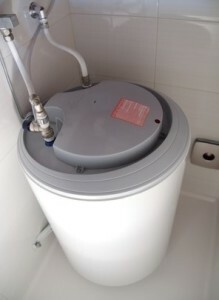 Our plumbers are dedicated to providing top quality water heater repair, installation and maintenance services for tankless water heater, gas water heater, electric water heater, traditional tank water heater, wood fired water heaters and solar water heaters. Give our plumbers a call today to discuss your hot water heating needs or to learn more about our solar powered water heaters.